Complete the sequence: Barbican (York), Alexandra Palace (London), _____ (Sheffield). Where did Wimbledon FC controversially move in 2004? Name either member of the comedy duo that collaborated with The Lightning Seeds on 1996 hit single Three Lions. What test cricket-playing country was both the birthplace of England international Basil D'Oliviera as well as the country that banned him from participating in England's 1968 tour? What 1997 romantic comedy film's characters are Arsenal supporters during the 1988-89 season, which culminated with Michael Thomas's title-winning goal in injury time on the last day? The 2005 American remake featured a similarly dramatic championship run. 'Fredalo' was the scandal in which this England cricketer drunkenly capsized a pedal boat (pedalo) during a World Cup campaign. With four gold medals - winning Team Pursuit and Omnium in both 2012 and 2016 - who is Britain's most decorated female Olympian? Who drop-kicked the winning goal in overtime when England won the 2003 Rugby (union) World Cup? "Which cricketer has scored the most first class centuries in history?" The answer to that question is England and Surrey batter Jack Hobbs - what movie did the question feature prominently in? What Yorkshire town is home of Super League rugby team ____ Giants and Premiership football side _____ Town? The 1990, 1998, and 2006 World Cups and the 1996, 2004, and 2012 European Championships are all instances of the England team achieving what feat? 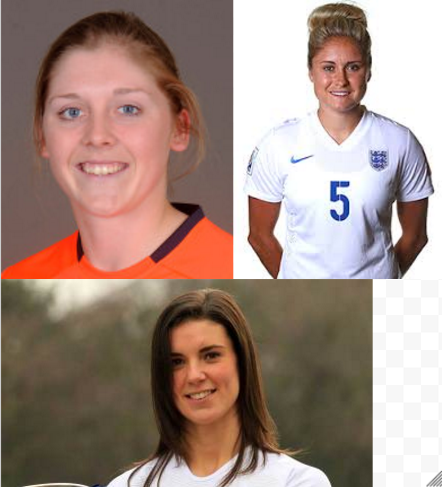 Identify either the England cricket captain (top left), the England football captain (top right), or the England rugby union captain (bottom).